Welcome to drugstore week! While Robin is on vacation, I'm going to treat you to reviews of fragrances you can buy with your lunch money. First up: Dana Classic Fragrances Chantilly. My first memory of Chantilly involves a gift set an uncle gave me for Christmas and an elderly woman who did handwriting analysis and numerology. I couldn’t have been much more than twelve years old, and in those days, Houbigant made Chantilly. Before embarking on the visit to the handwriting analysis lady with my mother and little sister, I gave myself the full Chantilly treatment — bubble bath, lotion, and a slick of Eau de Toilette. A six-foot Chantilly zone surrounded me. In the end, I over Chantilly-ed and couldn’t wear it again. Eventually the Eau de Toilette turned brown and I threw it out. But a whiff from the bottle I picked up for this review, and it all came back: the white bread sandwiches the lady gave us; her low-ceilinged, dim room with the jungle-like garden beyond the sliding glass doors; and her calculations next to the scrap of paper on which I’d written my name. 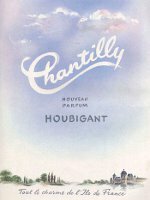 Houbigant first released Chantilly in 1941. Dana’s website describes Chantilly as a “chypre Oriental - A timeless Oriental classic fragrance with a blend of roses, jasmine, and Oriental mysteries.” Jan Moran’s Fabulous Fragrances calls it an “ambery-oriental” and lists its notes as fruits, lemon, bergamot, neroli, jasmine, rose, orange blossom, spices, ylang ylang, carnation, Indian sandalwood, moss, vanilla, musk, leather, tonka bean and benzoin. She attributes the fragrance to perfumer Paul Parquet. The Chantilly I sprayed from my 12 ml bottle of Eau de Toilette (two for six dollars at Walmart!) is definitely Chantilly. But I’d swear it’s not the Chantilly I smelled so many years ago, and my guess is it has suffered heinously over the years. Still, it is recognizably Chantilly, and that sort of signature is the sign of a great perfume. Sadly, instead of the heady list of notes Jan Moran cites, my Chantilly seems to be made of alcohol plus imitation Chantilly extract. Shake well and bottle. Today’s Chantilly opens with a cloud of snuffed-candle aldehydes and lemon, quickly followed by what smells like fusty orange blossom, powder, amber, and cinnamon. I can’t smell any moss, and leather notes are muted. It’s a grand, old fashioned powdery oriental made on the super cheap. Recognizing similarity in bone structure, I tried Chantilly next to a drop of Guerlain Shalimar extrait (I know this isn't fair), vintage Coty Emeraude Parfum de Toilette and Oscar de la Renta Esprit d’Oscar. Chantilly is definitely a cousin to Shalimar and Emeraude, and a great-great aunt to Esprit d’Oscar. Its lemony opening mimics Shalimar, but it is more powdery and less brooding than either the Shalimar or Emeraude. Wearing Esprit d’Oscar next to Chantilly brought out Esprit d’Oscar’s powder and tuberose and made it feel more oriental than I’d recognized before. Today’s Chantilly is comforting, feminine, and as sexless as knitting aunties watching game shows. But something about it is still wonderful. I can imagine wearing Chantilly while reading Great Expectations or wrapping Christmas presents. I only wish it weren’t so thin and one-dimensional. Made with the beautiful materials it deserves it must have been a knock out. On the right kind of maiden auntie, of course. Chantilly is available at most drugstores. Yay! Drug store week! Woot Woot! My Granny wears Shalimar to special stuff (like Sunday School) and Chantilly makes it into a more every day rotation to stuff like Dominoes! Whew! Shalimar in Sunday school! Your grandma must be a real hottie. I loved Chantilly when I was young! This was my first “sophisticated” scent – a step up from Avon’s Sweet Honesty and Loves Baby Soft. I haven’t smelled it in years and thought they stopped making it. It’s disheartening to hear that it’s not the same. Makes me want to get a vintage bottle off the ‘bay and compare, but I’m too lazy, and I’ve been spending my $ on other perfumes I want more. You can still get the idea of Chantilly and all its memories from the new bottles, but if it turned out you loved the Chantilly concept, probably going for a Houbigant bottle would be a good idea. Love Drugstore Week! A few months back, I bought bottles of Coty L’Aiment and Emeraude, just to see how they smelled, and I am never without a bottle of Muguet des Bois in the house, in fact I spritz it on before bed. Like Chantilly, it’s way more artificial smelling than it was in my adolescense (30 years ago), but after those first few minutes, it still smells pretty nice. And shelling out $7 for a bottle makes such a nice change from contemplating whether or not to bust the bank on a bottle of FM Vetiver Extraordinaire! There really is something nice in getting a perfume bargain! I love my Jean Nate, for instance, even though it smells like melted Saran Wrap for a minute. It seems so sad – to go back and revisit favorites from the days gone by, finding similarities but only a shadow of the greatness from the past. I remember your recent Norell review and similar sentiments. On the other hand, trying to re-live the past by obtaining “vintage” bottles have yielded mixed results for me, most recently with Jovan’s Mink and Pearls and Babe. Yes – Babe. I got a very partial classic spray bottle on evilbay, and although I could make out the notes that made me love this fragrance as a teenager, my older, more sophicated nose also noted qualities that I found very synthetic and undesirable. This may have been a bottle from a much later period so that the formula was changed, or Babe as I remembered it just wasn’t. For that reason, I would hesitate to revisit any current namesakes among my favorite drugstore brands, if they are even still in the market. I do enjoy your nostalgic writings, though, Angela – and will look forward to “sigh-ing” my way through your reviews this week. Oh, btw – my 1st college roommate (3 yrs older than I) wore Chantilly. One generous spritz at the end of her dressing routine – became so tiresome to my nose I really couldn’t stand it. I love the name though and it really did fit the (truth be told) prettiness of the scent. It’s true that for some things you just can’t go back. Once you know good wine, underwear that fits comfortably, the leather in a nice quality purse, and good perfume, it’s hard to go back. I remember Min & Pearls! Frankincense & Myrrh, too. I’d love to smell that one again. Opera Fan — I’m delighted to see someone else liked Cachet. It suited me very well (I had the lotion and dusting powder, too) and was my gateway to Clinique’s Aromatics Elixir. Okay, the inevitable question: what did the numerology/handwriting lady tell you? Did her “calculations” hold up any better than the Chantilly? The only thing I remember her saying (and I can hardly remember how she looked, I keep confusing her with a mentally ill lady whose house I cleaned when I was in high school) was that my name linked somehow to “6” (??) and communication. She said I might be a journalist. I do a fair amount of freelance writing, so she got that part right! Angela: I love Chantilly so I’m happy to see your review. Drugstore fragrances certainly still have a place in the world. 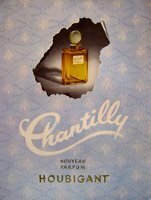 When I was a girl, my mom let me have a splash bottle of Chantilly that she didn’t want (she wore Emeraude and Pavlova). I *loved* putting it on – it made me feel so elegant! After it drained out, I kind of moved on past. But then about 5 years ago, I was kind of curious about a Chantilly gift box at the local CVS, and I truly enjoyed wearing it. It was actually one of the only fragrances I could stand when I was pregnant, so it has a special significance for me, even it if is cheaper these days. Just a note that the Givenchy Les Mythiques L’Interdit smells very similar to that whole aldehydes + amber + powder that you basically get from wearing Chantilly. I have a bottle of that too, and I don’t wear it nearly enough. I think that the overall concept of Chantilly, regardless of how degraded it may be now, is very much alike the “new” trend for pared down powders that are sweeping the fragrance market. Just enough aldehydes and florals to make it sophisticated, but basically an elegant cuddle fest. An “elegant cuddle fest” is such a nice description! I wonder if your child has a special connection to it since you wore it when you were pregnant? There was a perfume called Pavlova? The mind boggles. Or at least, mine does, because especially in Australia and New Zealand the word connotes a meringue-like dessert that you either love or hate. I hate it! That is so interesting about the Mythiques iteration of L’Interdit. There certainly is a trend to pared dowen powders. What goes around comes around, huh? I have a vintage (well, 1980s maybe) mini of L’Interdit, but find it thin and short-lived. I have often been curious abuot the Mythiques version. I like the Mythiques of Eau de Givenchy and have a whopping big bottle of it.. It is maybe drier than the original, but still good. I like the Mythiques L’Interdit, too, but to me it’s not too much like Chantilly–at least, not like the bottle of Chantilly I just bought. Maybe it smells more like older Chantilly? I think Pavlova was named after a ballerina, not the dessert. Although I think the dessert may also have been named after her as well. I remember reading that somewhere. Yes indeed, the dessert was named after the dancer. Thank goodness! Pavlova’s been around for decades. I became aware of it in the mid-80’s, but it already was an established classic by then, at least in the U.S. market. I got so excited reading it was drugstore week! Thank you for the review! The Dana perfume I used to wear in middle school was Love’s Lemon Soft and I fell in love with Tabu a few years ago. I have never tried Chantilly and probably won’t as I wear my Habanita when a hit of powder is needed. I am curious what the current formulation next to a vintage sample would smell like. So drugstore week – any hints as to what is coming next? Dare I hope that a review of Sand & Sable is on the way!?! I’m glad you like drugstore week! Tomorrow will be Navy, then White Shoulders. In a few minutes I’m off to Walgreen’s to see what I can find to finish up the week, but I was planning on, yes, Sand & Sable, and English Leather. Hopefully I can find them. YES!!! Navy was my first perfume!!!!!! You’ll have to let me know if it’s changed from the sound of my review! Gee – I wish I could remember more…anyway, hope you hit one of these! Hey, White Shoulders is definitely coming up, and we’ve done Love’s Baby Soft before. During last year’s drugstore week, in fact. I remember Heaven Scent! If I can’t find my two remaining scents for this week, I’ll pick that one up. It turns out I didn’t get Sand & Sable or Heaven Scent–they were out of my cheapie price range today. Instead, we’re doing a Brut/English Leather combo, and Jovan for Women. Drugstore week is exciting! Thank you. I used to love Muguet de Bois. I remember that it was very popular when I was a girl. I was also fond of L’Aimant and Oh de London (OK, that was Sears). I remember having a bottle of Love’s Fresh Lemon, and liking that a lot too. The only one I’ve seen in years is L’Aimant, and I’ve been hesitant to try it again because I assume that it won’t smell the way I remember. I prefer not to ruin the memory. I have a little bottle of vintage L’Aimant, and it’s so comforting and lovely. I totally understand not wanting to mess up the memory. Avon fragrances were just as big a part of my childhood as drugstore perfume because my mother, aunt and grandmother all wore them. Here’s My Heart, To a Wild Rose, Topaz…they all bring back memories. Oh yes, and those fabulous bottles! I think my first bottle of cologne that was given to me as a gift was Avon’s Sweet Honesty in a bottle that looked like a turtle. That’s hilarious. A turtle bottle. speaking of Love’s Fresh Lemon it’s recently been launched again at the Dana Classics website. I bought a bottle on a nostalgic whim and it wasn’t exactly as i’d remembered it (could be the passage of time or the air brush that memory can be making things better than they were) but it was definitely easy to recognize it as a lemon scent. Similarly one could easily pick out their Jasmin scent in its current form. I can’t say I’d wear either but it was a fun inexpensive trip down memory lane. angela I always appreciate your contributions and equally enjoy those of the others who comment. sometimes they are the best entertainment of my entire day (smiles). I’m glad you enjoy these posts! A scented trip down memory lane is always fun and sometimes really, really evocative. Could never stomach Chantilly, Heaven Scent, Emeraude OR Babe. After my Love’s Baby Soft Years (Rain Scent was my fave! ), and of course, my Avon Soft Musk, my drugstore perfume of choice was “Ambush” by Dana. I LOVED it! Smelled like nothing I’d ever come across! Oh, to be able to smell it again! There was nothing like it! You know, there was a 1990s Ambush and an earlier Ambush that I think was discontinued in the 1970s–both Dana–and they’re distinctly different. Someday we’ll have to review both! PS – VERY excited about Navy coming up! I just went through the last of my mini drug store spray. Alas, totally, not the same. I wore the heck out of some Navy in…wait, COLLEGE. Then I moved on to Lutece & Sun, Moon & Stars. Ah, those were the good ol’ days! That’s what I was afraid of, that Navy has changed. Well how cool is that! Chantilly was my wedding scent and was all I wore fir several years. I should buy a bottle of old time sake. I was a huge Love’s Baby Soft fan. My friend wore Chantilly. I also remember a drugstore one called Scoundrel that I liked. My mom was a Charlie fan. Exclamation was a big hit in grammar school. You were so cool if you had a bottle. I had a bottle of Exclamation! in elementary school. My big sis who was 10 years older than me passed it on to me. I thought it was so cool! I almost picked that one for this week, but I couldn’t find a cheap enough bottle. I think Scoundrel was the Joan Collins fragrance, right? I’d love to smell that one. It was Joan Collins! I forgot about that. Did Revlon buy the rights? I have a bottle of Revlon Scoundrel Musk. I’ve only tried it once (it came in a box with other stuff i wanted) and don’t really remember what I thought. If I remember it wasn’t specifically her fragrance but she was the face of the fragrance in the TV and print ads. though Joan appeared in an ad for Scoundrel 17 seconds of which can be seen on youtube I’d swear that susan Lucci advertised it too though her ad doesn’t seem to exist anywhere. If I recall Joan also had her own fragrance Spectacular too. Joan seems so much more a scoundrel than Susan Lucci! I bet it would be a fun commercial to watch. Oooh! Drugstore week sounds fun! I wasn’t a Chantilly fan (too powdery), but since many are listing their old favorites, I’ll list some of the ones I wore back in the day: Babe, Enjoli, Jovan Black Orchid (a dup for Vero Profumo’s Rubj extrait, I tell ya! ), L’Aimant (which I didn’t care for much – also too powdery), White Shoulders, and I loved Tatiana! Also had a bottle of Ritz by Charles of the Ritz which I’m dying to smell again (Coca Cola! ), but the vintage bottles on eBay are ridiculously high. I loved Tatiana, too! It makes me curious to smell DVF’s new one. My mom was a Charles of the Ritz fan, too. I scored a small bottle of vintage Chantilly at an antique store and was startled at how beautiful it was– all vanilla, orange blossoms, and incense, like Shalimar. Completely forced me to recalibrate my opinion of this old-timer. Oh, I bet it’s really wonderful. Until I read this I’d completely forgotten that my mother had a bottle of this on her dresser. It was in an ugly pink bottle, but it certainly did smell good. Good memories! It’s so nice when a fragrance brings back good memories. I look forward to drug store week for months. Seriously. YAY! Chantilly actually sounds like something I’d really enjoy trying. Hey, it’s a bargain if you get it in the right place. I got mine at Walmart, two small bottles for $6. I remember Chantilly! I also remember wearing Enjoli, Avon’s Sweet Honesty, Jean Nate and Herbal Essence perfume (to go with the shampoo). I’ll have to look for Muguet de Bois – I don’t remember this but it sounds like something I’d enjoy. Thanks for the nostalgia! Muguet de Bois was my first perfume–a Christmas gift from my great-aunt when I was 10–so it has a lot of memories for me. I had heard that it has been reformulated to death, so I was afraid to try the current version. I managed to score a 2 ounce vintage bottle on eBay for $11. There seems to be a lot of it available for reasonable prices, so if you don’t like the current formulation, or just prefer to find a vintage bottle, you should be able to find one at a good price. I’ve never smelled real lily-of-the-valley, so I can’t compare to that, but Muguet de Bois is a very pretty, fresh, light floral. If you ever have the chance, it’s so nice to have a little patch of lilies of the valley. They’re really easy to grow and small. The tiny, bell-shaped flowers are heaven in May. I tried planting some once, but nothing came of it. That is, I think a few little wispy leaves sprouted, but then they died. I think the Gulf Coast is just not a good area for them. The only bulbs I have had any luck with are hyacinths and daffodils. I wish I could grow LOV, as I was born in May, so they are “my” flower. Oh, too bad. Maybe they need more cold or something. I bet you’re right! My iliies of the valley all grow on the north side of my house, right up against the house, too. Those Enjoli television commercials were great! I’m sure I can still sing all the words. My friend just gave me a huge vintage bottle of Chantilly ! I will share if anybody wants to try it ! Carol, I’d love a drop, and would be happy to send you something in return, and pay for the postage. You are very generous! I bet lots of people take you up on the offer. Chantilly was one of the few fragrances my grandmother wore. She now has Alzheimer’s. Last Christmas I bought her a bottle hoping the scent would bring back some memories for her. I also put a small bottle in my mom’s stocking so she could feel close to her mom even as she’s far away (both physically & mentally). I hope it brings back good memories for your grandmother, or at least gives her the comfort of feeling like she’s still herself. Awwww my Mom-Mom (maternal grandmother wore both Muguet Des Bois and Chantilly. that coupled with old aerosol hair spray and rolaids always make me think of her (smiles). Chantilly is also my grandmother’s scent. My mom buys her a gift set every year for Christmas. Just saw her a few days ago to celebrate her 100th birthday (!) and she spritzed on some Chantilly before her party. I love these Chantilly stories! I’m in my 50s, so you could still buy wonderful scents in the drugstore when I was growing up. The grand Cotys, Revlons, Max Factors, Houbigants, Danas, Yardleys, and Faberges. You could pick up a bottle of almost anything for under $5.00. Truly halcyon days for budding perfumistas, had we only known it. I’ve been on a wonderous quest the last couple of years, seeking out the scents of my younger years, if possible in their vintage forms. Some of them are fun – the one I wore to 8th grade graduation, the one from my first date, my beach scent, etc. Others are so bittersweet – the one I wore to my dad’s funeral, the one I was wearing when my first love broke up with me, etc. But all of them are precious and special for the memories they invoke. I have a lot of love for those drugstore scents and even though most that remain are a pale shadow of their former glory, it’s still nice to see the familiar names on the drugstore shelves. Ebay is both a blessing and a curse, but I was thinking it was a distinct blessing a week ago when I was able to snag unopened bottles of Coty’s Elan and Faberge’s Kiku for 99 cents each. I had dreaded their arrival, thinking something MUST be wrong with both of them to go so cheap, but they were as close to perfect as you get with vintage scents. The seller enclosed a note saying that they’d found both, still gift wrapped, in a dresser belonging to a maiden aunt who’d recently passed away. The seller didn’t think anyone would want these old things and was thrilled to have a buyer. I wasn’t sure whether to write her back and tell her how thrilled I was, or if that would just make her unhappy to have sold them for so little money. I decided to keep quiet and let her remain pleased with her sale. What terrific ebay finds! Congratulations! Yes, the old days of drugstore fragrances were good ones. Just the Faberges alone would have been worth it. Nice comment. We tend to celebrate the classic Chanels and Guerlains and so on, and forget that most people could not afford them. The majority of perfume dollars were spent on the brands you mention, Yardley, Coty etc. How my mother loved her Yardley April Violets! Avon, too. I bet more people wore drugstore fragrances 40 years ago than they do now. I have an old bottle of Houbigant Chantilly parfum. I don’t notice any citrus, perhaps it’s deteriorated, but it’s a lovely, creamy, cuddly fragrance. Just a drop keeps me happy all day. Haven’t had any need to try the modern version. The lemon I get is right at the opening, sort of like the lemon in Shalimar. It sounds like you have no need for a new bottle of Chantilly! I’m sure yours is better. I can remember last smelling Chantilly in the 80s, and I really disliked it then. But then, except for certain things (vintage Emeraude! ), I am definitely Not an oriental girl. Nevertheless, this was a true Angela review: made me want to go and sniff. Chantilly could be really off-putting if you’re not into orientals. It’s really powdery and kind of sweet. But it’s a classic! My mother wore Jontue, too! I remember her once coming home and complaining her boss told her she was overdoing it with the perfume. Her reply was that all the women in that corner of the office wore Jontue. I loved Chantilly when I was a teenager in the 60s. As I matured I felt very womanly when I graduated to using Woodhue then Tigress, also from the drugstore. Then an older suitor gave me a bottle of Shalimar and life was never the same! Let’s hear it for the savvy suitor! My CVS on the corner has a large locked case full of fragrances. Every now and then I look over there and wonder if any of them are old enough to be pre-reformulation. Haven’t yet tried any — I’ll be eagerly reading NST this week. I bet there are some good things in there. In my local Rite Aid, I saw bottles of Samsara and Paloma next to the Britney Spears. By that time I was out of high school and discovered Norell and Ombre Rose, which became my signatures for the next few years as i tried to be a sophisticated bohemian in the city. Coco was my wedding fragrance in 1989. Fracas has been my favorite of the many I’ve worn since, but in just in the last few years I discovered perfume blogs, Chandler Burr, Turin and Sanchez, and niche, and now I have hundreds of samples to play with. But I still have a shoebox full of bottles from my youth and sometimes take a sniff when an old song comes on. They manifest themselves unexpectedly, too. I was trying to place the very familiar, slightly sweaty note in Etro Benetroessere Resort; a few days later I watched the 30th-anniversary rebroadcast of MTV’s first hour and saw the ad for Jovan Andron, the “pheromone fragrance,” and realized that was it. And the top note of L’Artisan Cadjmere was pure Chantilly! Wow! That list brings up all sorts of memories. I can practically see the bottles whizzing by. You’ve been a dedicated perfume lover for a long time! It sounds like they laid the groundwork for your future perfume loves. Tatiana has some of the white flowers in Fracas, and you mention Chantilly in Cadjmere. Welcome to NST, too! I hope you’ll comment often. Wow what a great list there I’ve smelled nearly all of those fragrances and can remember both the bottles in which they came and the tv ads touting them. thanks for the trip down memory lane (smile). Isn’t it fun to reminisce, robin? And it’s amazing how those TV ads stay on the mind, as they sang about Wind Song! Angela, thank you! I’ve enjoyed your blog for the last year or two and am happy to be joining in. In keeping with my quest for long-lost fragrances, does anybody remember a Love’s orange scent from the late 60s or early 70s? I think it was sold in a boxed set with the other Love’s light scents. If I can come up with the exact name and find it somewhere on the web I’ll be sure and buy some. If it’s impossible to find, can someone recommend a good alternative? Thanks! This post is pretty quiet now. You might try posting this question on one of the Friday open threads, though, and see what comes up.